Two boutique hotels scheduled to open in Charlotte in 2017. Kimpton has opened two new properties in the USA with two more to follow in 2017. The Kimpton Cardinal Hotel in Winston-Salem is Kimpton’s first venture into the Carolinas. The new hotel occupies the first six floors of the iconic former R.J. Reynolds Tobacco Company Headquarters, which served as the prototype for the Empire State Building. The decor highlights the building’s Art Deco architecture and historic past with original gold leaf, rich marble, burnished brass furnishings and portraits of luminaries R.J. Reynolds and Colonel Winston woven into the detailed boardroom carpets. The blend of tradition, modern furnishings and playful, Carolina-inspired artwork is apparent throughout the 174 guestrooms, 15 suites and the Recreation Room, which boasts nearly 2,000-square-feet of space, including a basketball court, bowling alley and adult-sized twisty slide. The group says: The room is perfect for corporate team-building, after-hours networking events, creative functions, or any unique occasion that requires an equally distinctive space. The Kimpton Cardinal Hotel’s adjacent restaurant, The Katharine, brings traditional French brasserie style cuisine with a Southern twist. Seasonal menus feature traditional favourites and an extensive beverage programme which includes creative cocktails, and craft beer and wine selections. Guest amenities at The Kimpton Cardinal Hotel include all of Kimpton’s signature offerings such as the daily complimentary morning coffee and tea service and in-room yoga mats but also go the extra mile, making guests feel welcome from the moment they arrive: guests are greeted with a Winston-Salem tradition of Moravian cookies and sweet tea in the Living Room. Paying further homage to the city’s heritage, an Art-o-Mat®, a traditional cigarette machine, distributes small pieces of artwork in the hotel’s Recreation Room. See website. 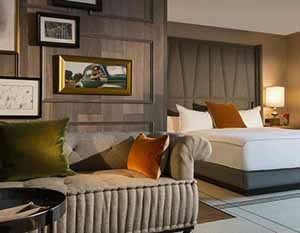 Kimpton Mason & Rook Hotel has opened in the 14th Street neighbourhood, near Washington DC’s renowned culinary and nightlife hotspots in a former apartment block. Kimpton’s new hotel features 4,000 square feet of beautifully creative spaces for meetings and events, 178 guest rooms and 18 luxuriously sophisticated suites. The group says that guest rooms offer plush beds, spacious work desks, large marble bathrooms and 65-inch smart TVs which inspire a home-from-home feeling. The hotel’s Premier Spa Suites feel like small apartments unto themselves with living rooms and spacious bedrooms, and each are outfitted with free-standing soaking bathtubs. The hotel’s adjacent bar Radiator is a culinary-focused cocktail bar that offers an eclectic menu of rustic yet contemporary American small plates and timeless cocktails with original twists. Radiator features an outdoor 50-seat patio where guests can enjoy snacks and sip cocktails in front of the large fire pit or play games such as backgammon and life-sized Connect Four in front of the breathtaking views of the iconic D.C. skyline. The chic penthouse deck also boasts a rooftop swimming pool to ensure a completely relaxing urban oasis. Guest amenities at Kimpton Mason & Rook Hotel include all the Kimpton brand favourites but also go outside the box. Every Wednesday evening, Kimpton’s signature nightly wine hour is hosted by a special guest who discusses topics ranging from style and fashion to spirits and music. This service, called The Made at Mason Series, aims to pay homage to artists, creators and tastemakers from the local area. On weekend evenings, the roaming Bar Cart Service serves Moscow Mules, Old-Fashioned Daiquiris, Manhattans and Gin Martinis created room-side upon request and crafted by Radiator. See website here. Kimpton will add two hotels in Charlotte next year, one as a luxury high rise, located in the heart of downtown, and the other a boutique in the historic Dilworth neighbourhood. The group says: As with all Kimpton properties, the two new hotels in Charlotte will embrace the history and culture of the city and will include all of Kimpton’s unique services such as the Forgot It? We’ve Got It! menu of travel and vacation essentials, a thoughtful mini bar with organic options and a hint of local flair, the daily complimentary morning coffee and tea service, a hosted nightly wine hour, an in-room yoga mat and complimentary rental of their custom PUBLIC Bikes. The new builds will both host their own destination restaurants and rooftop bars/ lounges. The boutique hotel and restaurant company now has 60 properties spread across the USA.